Before WW II Irritation often circles around Audi and Horch. August Horch was the founder of Horch. In 1909 there were arguments in the company. Horch -slightly upset- left it and founded in the same year the A. Horch Motorenwerke AG. But the old company Horch had secured the rights on the name "Horch", resulting once again in problems. To avoid these, August Horch renamed his company in Audi, Latin for "Horch!" meaning "Listen!". The idea came from the son of a co-worker in a meeting. Audi soon gained a reputation with its "Alpensieger" (meaning Winner in the Alps). These sportive cars were not only called this way. They truly lived up to their name. Even if Horch started out with little cars, today Horch is best-known for its huge straight eight-cylinders, giving ample power to elegant luxury cars. 1932, the fusion was a deep cut. Within three years, the program was completely restructured, resulting in a better use of resources (yes, even back then! ), but still leaving the character of the different companys exist. That way, Horch established its role in the luxury market, while DKW became famous for its motorcycles. The most widely known "product", however, are for sure the "Silberpfeile" (meaning Silver Arrows). 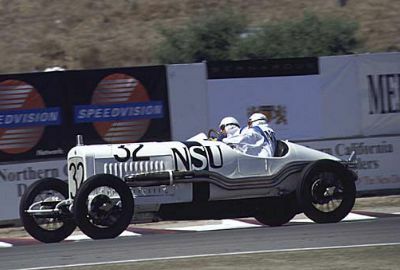 Powered by supercharged V16s they fought hard battles with the Mercedes Silberpfeilen. 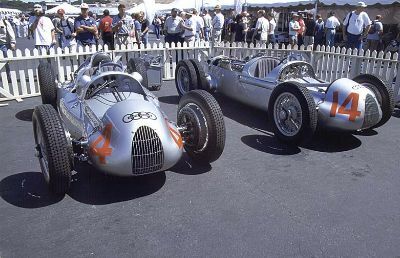 On the right the Auto Union hillclimber, on the left the circuit racer. Both were restored by Audi in painstaking work and now are in immaculate condition. Their worth cannot be estimated. After WW II: Consolidation and management by Volkswagen After the war, it was especially DKW with their 3=6 principle, that was productive for Auto Union. In 1964/65 VW already owned 50,3 % of Auto Union. Under the management of VW, a four-stroke engine, developped at Mercedes during the short period Auto Union belonged to Mercedes was built into the DKW F 102. Its name: Audi, with no other extensions yet. The reason for this step was that the old two-stroke engines just didn't sell any longer. In the transition time until the Audi was introduced to the market, the VW Käfer (aka the Beetle) saved Audi, as it was partially built in Ingolstadt. Since 1966 Audi is a 100% daughter of VW. In 1969 NSU came to Auto Union. NSU is most widely known for its motorcycles, the Prinz (meaning Prince) and the misfortuned rotary engines, called Wankelmotor. NSU was a pretty old company, having had success even before WWII. Some of their racers were converted to streamlined worldrecord racers, but not this one. This Wankelmotor was a pain for the oldfashioned VW-guys. Sure, it did have its problems, but these resulted in the main part of a too fast introduction to the market. The high fuel consumption was not too important before the oil crisis in 73. However, later the decision against the Wankel should be considered right.